100g skein of merino aran yarn gradient dyed in rainbow colours. Custom slots are also available using this technique if you would like different colours. I'll go for the organic merino please. The organic merino is lovely and soft but having said that, the standard is pretty soft too. I tend to use mainly the standard one when I am knitting for our own use although maybe that is because I am too stingy to use the posh stuff The BFL is British, although aran BFL is out of stock at the moment. I can still get DK or superwash sock weight BFL, just not aran weight. Great, is the standard merino aran ok or would you like a different base? 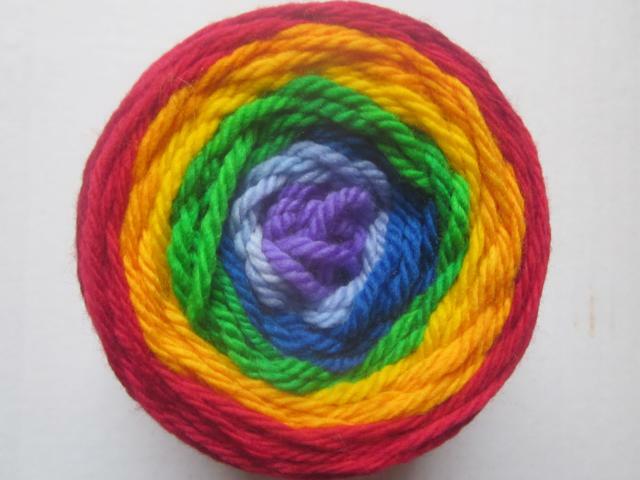 And do you want rainbow like in the pic or did you have a different colour scheme in mind? Yes, 3 skeins should work. Any more than that & I may struggle for the room to heat set it but 3 skeins should be ok. I don't know! Perhaps 3 skeins? Would that work? I dont see why not, although I've never done it before. How many skeins were you thinking?